With the end of the year comes the onslaught of the “awards” films – you know the ones. The movies that are dripping with desperation to be granted the “best (fill in the blank)” accolades. Beautiful costumes, historical scandals, physical hardships – all the trappings of an Oscar movie. Unfortunately, we’ve had to wait almost the entirety of 2017 for basically any movie of significance to grace our theaters. But television? What an exciting time. Besides Hollywood finally starting to own up to its misogynistic disgraces, they are also starting to put women FRONT AND CENTER. I’m talking female creators and writers, women as the leading roles, stories about and for us. Unsurprisingly, they have been my favorite shows of the year – and the favorites of many others. Hollywood, thanks for starting to listen. I’ve already shared my unexpected love for the series GLOW (I even dressed up as one of the characters for Halloween), but my other two favorites have been Big Little Lies and The Marvelous Mrs. Maisel. I was hooked on Big Little Lies the opening moments of the show. Something about that initial cinematography and music swept me in like a hurricane. I was so intrigued by the performances throughout that I had absolutely zero theories about the case being solved (which is entirely unlike me, as I can’t stop theorizing any time I watch a show about, well, anything). Reese Witherspoon and Nicole Kidman gave the best performances of their careers, and the direction and editing was utterly fantastic. It’s a show about women – beaten, bruised, and battling – and how they rise together. Stop what you’re doing, and go watch this show immediately. Now, if you’ve spent any time talking to me, you’ll also know I am a huge, huge fan of Gilmore Girls (another show about women, go figure. KEEP LISTENING HOLLYWOOD). So naturally, when its creator, Amy Sherman-Palladino had The Marvelous Mrs. Maisel coming out, I was forced to watch it. I’ll be honest, I had my hesitations, but damn is this show delivering. Set in the 60s (style swoon), it’s a comedy about a New York socialite whose world is turned upside down; she then ventures on a journey of independence and stand-up comedy. This world Amy has created with Rachel Brosnahan at the center is titillating; her confidence and drive and no BS approach to life is inspiring. I am absolutely fawning over Rachel’s stand-up scenes – that girl has got some serious talent (and has, deservedly, scored a nomination already). I’ve been reading interviews with her where she discusses having always felt secure in drama and was taken aback at her knack for comedy. I’ve started to find my footing in comedy too and am realizing it’s not so scary after all (and actually really, really love it). Now all this #FEMALEPOWER on television is uplifting and inspiring and all that jazz, but I’m just as excited about the women I know doing really, incredible things. It’s amazing the drive we have, isn’t it? That’s why I started my Real Life Girl Boss series – to showcase and support these women making their dreams a reality. I know I’ve stepped away from this space a bit, but I’m re-prioritizing the commitments in my life and am hoping to continue to share the stories of these women. Nathalie, my first Real Life Girl Boss feature, has finally moved to LA – I can’t wait to see what she does out here (she already sang with Jeff Goldblum at a jazz club) and for the opportunity to create with her. 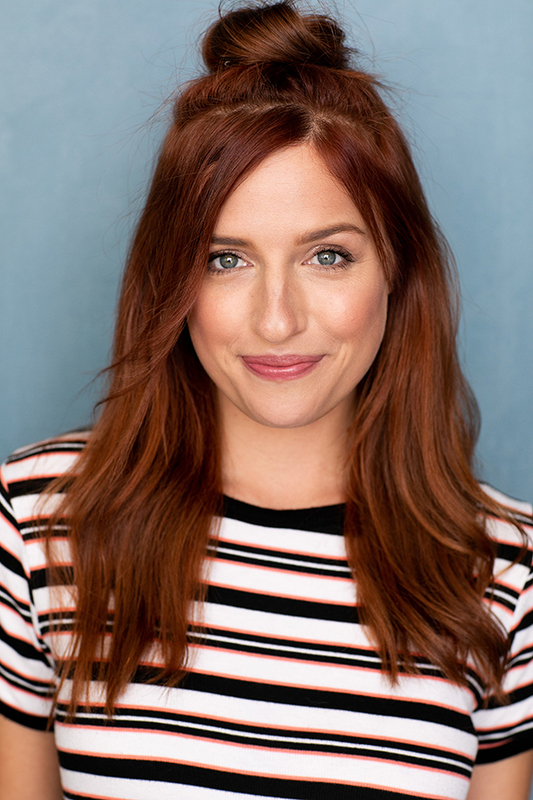 A namesake and co-star in that horror film I did a few years ago, Sam Valentine, is providing tons of immeasurable industry advice on her podcast 1 Broke Actress. My friend from college, Barbara, is now a writer on a prime time television show with arguably the most famous TV creator today. A lot happened in 2017 – to the world, to myself. I traveled. I watched. I listened. I grew. I challenged myself and made personal strides. It feels good to finally learn some things that only took a couple decades (more or less) to stick. I’m done making excuses, and I’m done not doing the things I’ve set out to do. See you in 2018 (and hopefully on TV). Happy New Year, Sam! 🙂 Wishing you all the best moments for 2018!